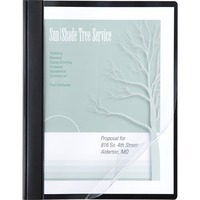 Show your title page with a transparent front cover and a colored vinyl back. Report cover is durable and water resistant. 12 capacity fastener secures up to 100 letter size sheets. Multiple back colors available.